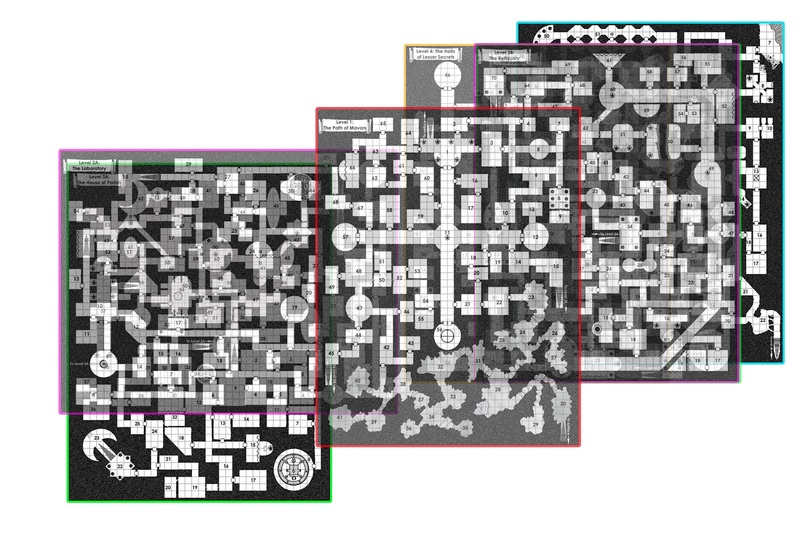 What I like about these cross-sections is the way they provide context for a dungeon by showing how all the various levels interrelate with not just one another but also the surrounding environment. I think that's key to presenting a compelling tent pole dungeon for long-term campaign use. Doing this was incredibly helpful, since it revealed a couple of minor errors in the cartography -- places where the connections between levels didn't quite work out as they were intended to. While easily fixed and relatively minor in nature, neither of us would have noticed the errors if we hadn't undertaken this exercise. 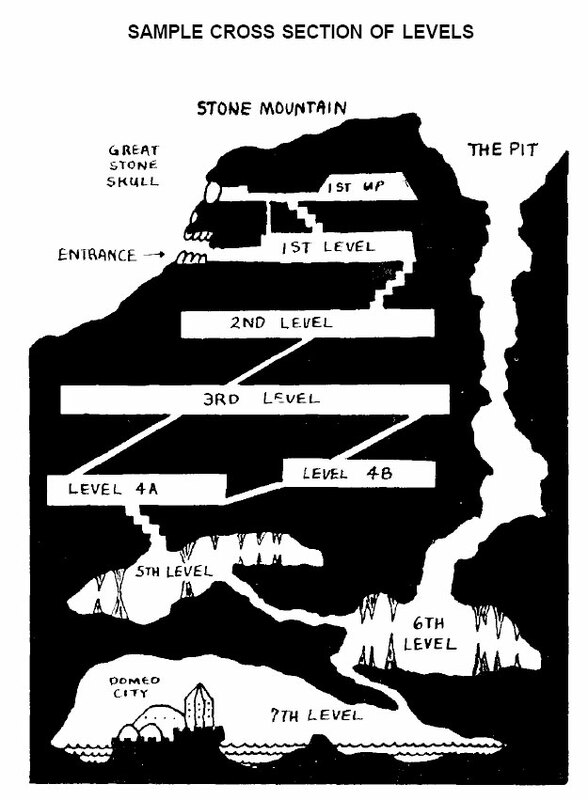 More than that, I got a different perspective on ten dungeon levels than a cross-sectional illustration might provide. I still think cross-sections are useful tools for referees and players alike, but they do have limitations, no matter how attractive and inspirational they may be. A top down view... interesting. I'm stoked for this James... Dwimmermount looks to be very cool. On a side note, that 3D, or "connected" feeling that you get w/ maps like that was one of the reasons that I absolutely adored Caverns of Thracia. Paul's maps really did something for me. They made it feel as if it really was a cohesive environment rather than a slew of random pieces of paper w/ different levels drawn upon them. 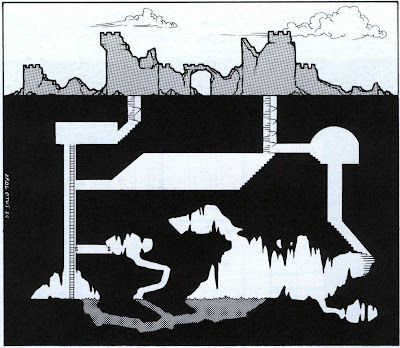 Caverns of Thracia is the gold standard when it comes to sprawling interconnected "tent pole" dungeon complexes. It's simply amazing. I assume you have in mind a cross-sectional view, as well, like those shown above? I do! That's more or less been a dream of mine since childhood, since I wouldn't pass up an opportunity like that now that I can do so. While 2D seems good for some basic dungeon layouts, I wonder if multi-level dungeons might be better represented by 3D modeling tools (Google Sketchup et al). Using layers, you could produce the 2D level maps and then combine all the layers to get the vertical cross-section. I've played with making a model of Dwimmermount in Google Sketchup, but thus far haven't been able to put in too much time on it. And most of that time was learning to use Sketchup and some false starts. I've used Sketchup a few times here and there at work and it seems like it'd be a great tool for the job. Do you have a model already started for Dwimmermount? I wouldn't mind collaborating on such a thing if you're interested, even if just taking alternate levels or something. One of my face to face players was going to do something similar but he never got very far, alas. It's something I'd love to see for a number of dungeons, come to think of it. 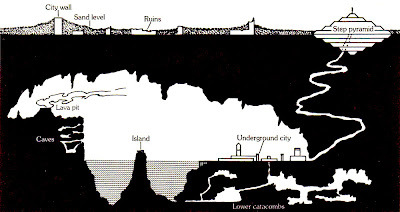 I have worked on a 3D model of the Caves of Chaos, and it has revealed a number of anomalies. For the megadungeon I am currently preparing for gaming I have been counting distances, exactly to avoid space anomalies (although they may show up intentionally). I'm still a big fan of "The Lost City" cross section. Really fires the imagination and provides some great perspective on the dungeon. I'm reminded of the 3D maps in I6-Ravenloft. My 12 year-old self drooled over the beauty and complexity of the Castle Ravenloft maps. They combined the aspects of utility and style together. But they were rather decadent and definitely not reasonable for a small publisher to produce. Anytime I draw a multi-level dungeon I do the same. Not on a computer, but by matching up the graph paper sheets and making the connections, seeing how one level stacks onto another, assuring the inter-level stairs, ladders, and so on all work. Personally, while I like the stone skull style cross-section as an evocative image, I never saw much use for those drawings as game aids. I agree on the Ravenloft maps. I think they were a great style combining the benefits of the cross-section and the overhead map. 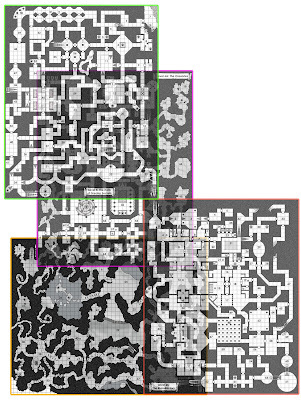 You really got a sense of that castle as a real interconnected place in a way you never did with most D&D maps, which helped a lot in visualizing and describing each area. That's odd, I find Moldvay's cross section from the Basic Rulebook very evocative, though I agree that The Lost City is also a wonderful cross section. Ah yeah! 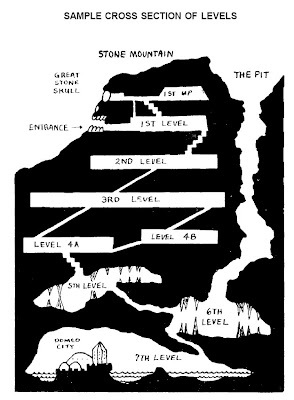 The Ravenloft maps were a wonder to behold. But how well do you think an isometric view would work on something as sprawling and layered as Dwimmermount? As you say, it would be quite an effort I'd imagine. The overlays are great for map correcting, as you point out, though I don't know how useful they'd be in play -- never tried that, myself. I do like the cross-sectionals a lot, if only to give an overview for the GM. Funny enough, over at the Cartographer's Guild we recently had a competition for side-on maps ... which dove-tails pretty well with what you have posted this time! That's beautiful, Luka! It reminds of Breugel's "Tower of Babel," for some reason. I never thought of cross sectioning before. What a great concept. 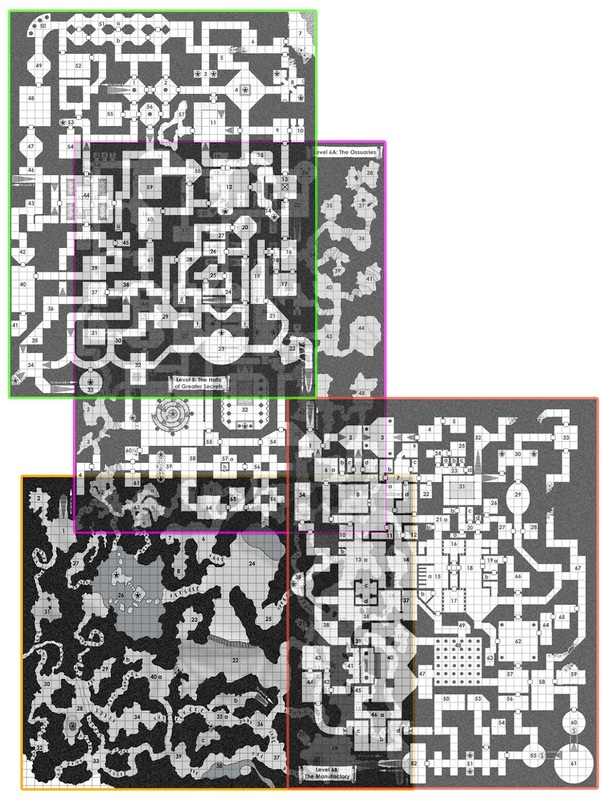 It's much easier to see at a glace how much the dungeon levels go down. And what is the situation with the empty room problem in dwimmermount megadungeon?